That’s why I don’t own a yogurt maker. Or a quesadilla maker. Or a juicer. I use a heating pad to make yogurt. My standard cast iron skillet for quesadillas. And I have a super-cool Blendtec that will pulverize anything I feed it, including an iPhone. That Blendtec is actually the first thing on my list of things to grab if the house is on fire. I use it every single day. Sometimes twice a day. My lovely, red Kitchen Aid stand mixer (a wedding gift) is number two. I use it at least once a week and really saves time in breads and desserts. And it’s red, my favorite color. Now neither of these are must-haves. You can make high-protein smoothies just fine with any standard blender (which we used for a long time, without a lid mind you, before getting the Blendtec). You can use a very simple hand-held mixer, like what Walmart offers for $5 on Black Friday, cakes and cookies and your own two arms for bread dough. When it comes to grain, you need something a little stronger than a mortar and pestle so I poked around my kitchen to see what might work. A coffee grinder is one of those must-have appliances for die-hard coffee drinkers. I mean, it’s seriously just better that way. It doesn’t have to be fancy grinder. This basic coffee grinder will work just fine. To get a finer grind, run the berries through two cycles on the coffee grinder. My coffee grinder has an auto-timer and shuts off when the cycle is complete. If yours does not shut off automatically, grind for 45 seconds and then repeat. You will need to sift out a few larger pieces with a fine mesh sieve. But you are left with a fairly decent flour that’s on the coarser side. Note: If your grinder is a bit aged like mine, you may notice it getting a bit warm during the process. Apparently the grinder isn’t designed for those who enjoy multiple pots of freshly ground coffee throughout the morning… just take your time, letting it rest and cool as necessary. If you know you’ll be needing the flour immediately, you may want to grind it a day or two ahead of time. See tips below on proper storage. If you don’t have a coffee grinder, you probably have a food processor. You may have even received one like this for your wedding or Christmas. Don’t let it collect dust any longer and put it to use grinding your grain for fresh bread! When I tried mine, it worked similar to the coffee grinder. I had to run my berries in it twice to get the powdery grind needed for baking. There was a little bit leftover when sifted. Using my blender is my favorite solution to my no-grain-mill problem, especially since it can turn an Apple store into dust. As you read above, I use often use my blender multiple times per day. Blending protein smoothies is my favorite way to start the day. And I use it for my kids favorite snack, chocolate chip cookie dough hummus. Even tomato soup and pancakes can be made in a blender! A blender like the Blendtec is quite an investment, but one I highly recommend considering it’s various uses. Grinding grain in a high-powered blender works amazingly well. I sifted the flour after I was done to make sure it was all ground and barely got any bits leftover. It was by far the best grind I got out of any of these 3 methods. One thing to consider with these non-mill methods of grinding. These machines aren’t designed for grinding hard grain. If you use any of these appliances for lots of other things, you might wear out your the blades quicker than desired. Once you determine if grinding your grain fresh works for you, I suggest saving up for a mill. (We ended up getting this grain mill after a while.) This will save your other appliances and also give you a better grind. 1 cup of whole berries yields approximately 1 1/4 cups of freshly ground flour. Bagging and shipping flour makes it settle before you find it at the grocery store. Freshly ground flour is light and fluffy. Measurements of flour in most recipes are referring to settled flour. You can prepare your flour in advance to account for this, or gently tap the measuring cups to settle the flour within the cup. Freshly ground flour contains all parts of the berry, including the fat. Store any unused flour in a sealed container, in the freezer, for up to 30 days to prevent the flour from going rancid. You may be wondering why grinding your own grain is desirable when whole wheat flour is readily available at the stores. When you grind fresh flour, you retain the highest amount of nutrients available in the grains. The entire bran (outer coating), that has a lot of the nutrients, remains with the flour. Now, I know whole wheat flour at the store is darker in color like the wheat you grind at home, but oftentimes companies will refine all their flour then add back in the bran to make it “whole wheat”. Similar to how they enrich all-purpose flour. This defeats the purpose of the whole wheat flour being less refined and more nutritious. Don’t get me wrong though, there is a time and place to buy pre-ground flour! I’ve been in that boat as well before we could regularly grind our own grain. Soaking or making sourdough bread helps you regain some of the nutrients that turn dormant after grinding. Another reason grinding your own flour is better is because of the cost. It is much more cost effective to buy bulk grain and do the work yourself. Tropical Traditions and Palouse Brand have good prices on bulk grain. Also, check your area for a local coop. That is often the best way to get the most from your dollars. Do you grind your own flour? Do you have a grain mill, or have you tried this method? Leave your comments below! Flour Face Off: Which Wheat Makes the Best Wheat Flour for Cookies? 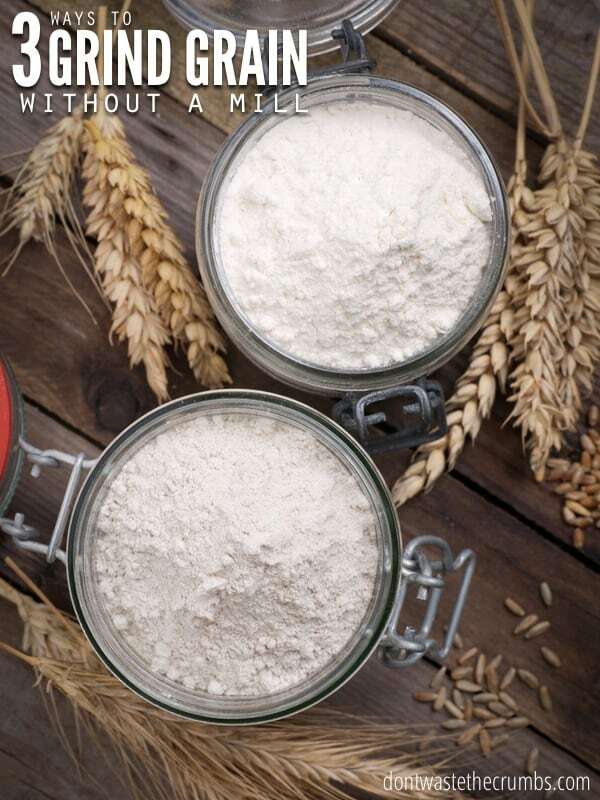 « Flour Face Off: Which Wheat Makes the Best Wheat Flour for Cookies? Wow!! This is so cool! I have been drooling over a grain mill for a while but just can’t fork over the money for something, like you said, that only serves on purpose. I can’t wait to try this out!! If you are not able to afford a brandy new machine, there are used REFURBISHED models that cost less. I wouldn’t have bought a brand new carpet cleaner because of the cost, but after doing my research I settled on a model I wanted. It just so happened that a local sew ‘n vac store had a used refurbished machine. I bought it back in 2010, I still have it and I love that thing! The good thing about a refurbished model is that it is gone through, tested and given individual attention so you KNOW it works! Sometimes a person will buy a machine, use it once and decide not to keep it. It gets returned and checked to see if it’s defective. If it can be fixed, it’s cleaned, repaired and tested. Then resold at quite a savings! I can tell you that I’m okay with this and I actually prefer a refurbished machine. I think I’m with you Raquel – I have no doubt that it would be used regularly, but it’s just not in the budget at the moment. C’mon Swagbucks, lol! Yes Joy, I had a sneaky suspicion you’d offer your wonderful first hand knowledge on a grain mill!! Your experience and opinion is definitely valued! You’re right on burning out the motors on smaller appliances. I had to give my coffee grinder a bit of rest after a few minutes. The grinder I used is actually our spare, so I’ve dedicated it to grains only, removing some of the cleaning requirements. The small food processor isn’t used too often, so I brush it out well and plan to clean it before and after I use it for something else (if/when that happens). I could make room for the mill if I cleaned out and sold a few things on a shelf… which would in turn help me save up for a mill, lol. Kudos for kicking out the microwave. I did the same. The other thought I had is the concern about a higher heat from these coffee grinders that could affect the quality of the flour. I have a Wonder Mill Jr. Hand crank. It’s great but tiresome. I plan to keep it in case I need it, but an electric replacement is needed. I think I’ll go with an attachment for my kitchen aid mixer. I do think the use of a coffee grinder is ingenious, and thought of it too, hence findng this thread. I would use it as a short term fix and consider budgeting for the mill when possible. Thanks ladies. What type of mill are you using ? Could you recommend one? Yes, definitely a difference when you grind at a med. to coarse setting vs. fine. I choose med. to coarse because I know the larger pieces of bran/germ in the flour will create more cleansing fiber. The bread comes out more hearty for sure, but not really seedy. On the other hand, I often have company who are not used to whole grain ANYTHING. In that case, I will often mill hard white wheat (with some Kamut mixed in) on “fine” and they usually LOVE the bread and are very surprised when I tell them it is made with 100% whole grains! If you want seedy bread, why not add seeds? I love millet, flax, sesame, and sunflower seeds added in, and I have also heard of adding CRACKED wheat to the dough (although haven’t personally tried that one yet). I only have one of those baby coffee grinders. I think I may lose my mind if I did it this way. Then again I’m always up for a challenge 😉 I’m one of your newer followers and love what I am reading so far! Thanks for joining the ride Richelle! You’re welcome Jill – be sure to enter in the rafflecopter form to get credit for both entries in the giveaway! This is genius! Thanks for sharing! I had started grinding my own grain in my vitamix but my loaves were always a disaster. I was trying to do too many things from scratch and also using sourdough starters too. So now I have a bread machine and standard yeast I might try this again. Although I’ve been told the wheat grain here in the UK is much lower in protein than the USA and so not as good in bread. I’ll have to try it again though. Thanks for the reminder! Love the article – so fun and true!!! Thanks for gearing it toward REAL people who live on a limited budget! Please post info. about ANCIENT strains of wheat – the ones low in gluten, high in vitamins, etc. that are still actually good for us and the best to buy. Thank you and God bless!! Thanks JAM! I’ve made a note to visit ancient strains of wheat when we re-visit the rest of carbs again (haven’t even touched sugar yet!). Thanks so much for the reminder! I knew it! I figured there had to be a way to grind wheat without a special appliance (after all, Ma Ingalls did it with a hand coffee grinder), but I didn’t want to risk breaking anything. You took that risk, and I thank you. I’m saving up for the mill attachment to my KitchenAid stand mixer. It is smaller for storage, and I know my mixer will be around for years to come – it’s already been in service since 1993. Can you simply use the food processor? Will that work? I wanna try it today but I don’t have a coffee grinder or a grain mill. You can try that too Brie! I didn’t have a food processor at the time, so I wasn’t able to test. If the grains are still too big, run through a blender after the food processor. I like Brie was wondering the same thing, but also, I have the grinder attachment (for meat and bread) for my kitchen aid and was wondering if you thought that would be a sufficient replacement for the coffee grinder? I used my nutribullet (grind attachment) to make kamut flour from the grain, and it worked great. Didn’t even have to use my food processor. Thank you for the wonderful idea! I’m coming into the discussion late, but thought it important to share my experience. All I wanted was to crack some spelt & kamut berries for bread making, just a few, so I tried my coffee grinder. Hadn’t found your webpage yet, so hasten to add that I’m not blaming you! Previously had used the grinder for coffee, spices and seeds – in other words, nothing hard. I thought I was a genius for about two days, then felt something strange in my mouth as I ate a piece of the multigrain sourdough I’d made. It was a small piece of plastic from my coffee grinder, an old Braun KSM2 no longer on the market, so I can’t replace it. I’m sad but don’t feel I can use it for anything else now but the softest seeds and spices. And I’m leery about that! The bottom rim of the lid has lots of nicks and uneven spots now, not just the bite out of it for the piece that ended up in my mouth. That’s why I’m researching milling now, along with brand options for a new coffee grinder. Sometimes penny-wise really is pound-foolish? I’m sorry you ran into issues with your coffee grinder Carol! I didn’t have these issues, and the grains didn’t cause pitting in any of my appliances. I’ve heard that they COULD, but haven’t experienced it myself. Bummer! I hope you find a mill you like. I now have a Wondermill and have heard good things about the Nutrimill too! Thanks for the reply and condolences, Tiffany. The Braun was old and much-used, so that’s possibly why I ran into those issues. I had noticed that the plastic lid seemed to be drying out, especially after I began grinding flax seeds on a regular basis last year. I found a new coffee grinder today that looks good, not terribly expensive — the Hamilton Beach custom grind. I’m thinking that my current milling needs just aren’t worth the purchase of a separate appliance, These are test breads, though, so who knows? I may get a mill later. For now, I’ll try cracking the grains in the new grinder, but carefully! If the coarse setting pulverizes them too much, there’s an on-off button I can use for short bursts. Here’s hoping! I’ve got my fingers crossed for you Carol! Which grain mill is recommended? Hello and thank you for your awesome blog. Would love to know which model of Blendtec you have and love? I’ve used the Designer series too, and love them all! Hi, I’ve been making my own oat flour with a coffee grinder for a couple of years now but wondered how the harder grains would go. I was looking at both barley and rice to grind in the coffee grinder but not sure if that would be able to take the hard knocks … though coffee beans are hard. I think starting with something a bit more robust, like a food processor, is a good idea. Coffee beans are hard, but we don’t know how hard in relation to whole grains. Better safe than sorry! I read a lot of comments about KitchenAid mixers. I was a life long fan too , until my friend Kelly the Kitchen Kop introduced me to the Bosch. I felt like a fool. Since I eat for health and feed many generations, I soak my breads and grain recipes overnight. This breaks down the gluten, eliminates phytic acid and releases maximum nutrition. The Bosch comes with a beautiful clear cover that lets my recipes sit overnight w/o drying out. It also handles twice the capacity of the largest KitchenAid . Check out the video on the Bosch site. The CS with Bosch puts KitchenAid to shame. Your local Bosch dealer will gladly tell you when a sale is coming up and the price difference is nothing. There r grain mill and blender attachments available. No fancy colours, just white or stainless but this wonder machine also weighs a fraction of that hefty other machine. Bosch is rated number 2 in mixers but only because they don’t advertise. It is also quieter. I make all my own bread and the Bosch can make 6 loaves at one time. KitchenAid can’t come close. I burnt out 2 of them and doing my research, found out this is common. If you are considering buying a new stand mixer, the Bosch is really the only option. Would a burr coffee grinder do the trick too? Oh and granted that I’m planning on paying 54usd for the coffee grinder would a powerful blender be a better investment around this price point ? if so how can i tell if a blender is “powerful”. Thank you. Thank you for your answer ma’am, I managed to see it just before taking off for my quest. The reason I asked you was because one of the comments got me confused as to how much really a blender good for grinding grains would cost and your link cleared my doubt. I am just starting out and I totally agree with you, but this is just the best i can afford at the moment in this time frame, which is a bit on the longer side and that’s why I needed a better coffee grinder. Its not because I’m expecting any major differences in results as far as the finness of the flour is concerned. compared to the other grinders i have access to, this one has more room for grains, it grinds and stops by itself, and is overally more convenient in terms of cleaning and maintaining and pretty much everything else. Update: I tried grinding wheat with a 750watt 2in1 blender and a processor, i started off with the blender then I used the processor, the result was a powder with specks of tiny grains here and there, how is that compared to a coffee grinder? Do i still need a coffee grinder? Nope, it sounds like you made a great flower with the 2-in-1 Emmanuel! That’s perfect, I’ll use it as I invest in either a manual grain grinder or better yet an electric grinder, thank you! I don’t have a mill and was looking every where for a method to grind my grains. Thanks to this article, now I have three different ways! At first thanks for your great article to make a wonderful recipe flour. Such an interesting recipe helpful for every housekeeper specially friday or office holidays. My sons like this recipe. please keep it up. Hello Tiffany, I was wondering what you thought of the KitchenAid mill attachment? I’m looking at investing in a KitchenAid but if I do that, I would rather get a professional version (600, 650, or Pro Line 7) and perhaps also use it for milling. Was wondering if you had any experience with this as some of the articles I’ve read say the mill will burn out the Artisan, but I can’t find anything on milling with the 600,6500 or Pro Line! Hi Leah! I haven’t milled using the KA attachment, and just recently bought a separate grain mill because while you CAN mill grain without a mill, it doesn’t have near the texture you really want if you’re a frequent baker. Hopefully someone else can chime in regarding the attachment for you! You mentioned you use a heating pad when making yoghurt, how does that work because I’m never successful when I make yoghurt in the winter. Do you mean the heat pads you buy at the pet shop or is there some other kind.